On a miserable wet cold Friday night, we went to see George Ezra play the Liverpool Guild of Students. With this having sold out soon after the release of his second record, ‘Staying At Tamara’s’, it was one of the most anticipated nights around. Arriving at the venue sometime after doors, it was clear it was going to be a busy night with the queue going on for miles. After finally getting through what seemed like a never-ending line, the first act promptly started as soon as the clock hit 8. Starting the night was the wonderful Ten Tonnes. Having seen him across the country over the past year, I am always excited to see his name on any bill, and tonight was no different, especially after the recent announcement of his new self-titled album that will come out next year. Playing the title track from his second EP, ‘Born To Lose’, he got the crowd in the right mood. An upbeat set filled with older classics like ‘Lucy’ & ‘Cracks Between’, was combined with more recent releases such as ‘Lay It On Me’, ‘G.I.V.E.’ and a brand new song ‘Look What You Started’ taken from the upcoming album. The last new songs he played were ‘Better Than Me’ & ‘Counting Down’ which are also taken from the new album. The latter is a much rockier and fuller sound than some of his other releases, and I wonder could this be an indication as to where his sound is going? With this being just his second show in Liverpool, we at Popped Music hope there will be many more to come in the future. As soon as Ten Tonnes had finished, you could feel the atmosphere crank up even further in anticipation of the main event. 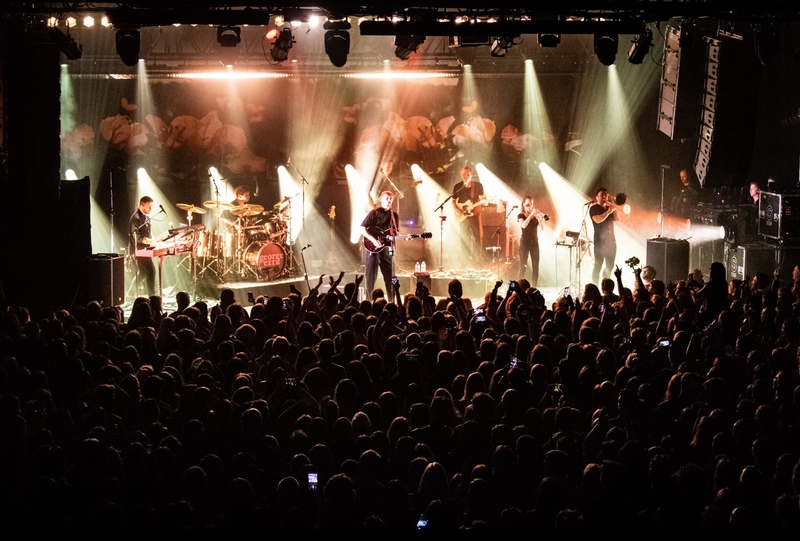 Coming out to a huge roar of cheers as he entered the stage, George Ezra kicked his set off with ‘Don’t Matter Now’, a song from his most recent album. This fairly chilled tune sort of acted as a warm up for the crowd, but they didn’t need it and were in great spirits from the get go. His second song of the night was ‘Get Away’ which sounds as if it may have some soul music influence, with the trumpets playing as a secondary sound on the song. Somehow, this was one of the less familiar George Ezra songs to me, but as soon as I heard this live it went straight onto my playlist and has been on repeat ever since. Rattling through tunes like ‘Barcelona’, which is much slower yet still firmly a fan favourite, ‘Pretty Shining People’ and ‘Listen To The Man’, the crowd were singing through every second not missing a single beat. Whilst songs like ‘Get Away’ have a slight soul undertone, ‘Listen To The Man’ for me has more of a reggae influence, which combined with his gritty guitar sound and very pure voice results in a great sing-a-long track that everyone can get groovy to. At this point of the review I would just like to highlight my slight annoyance at the people who find it necessary to have their phones out the entire night and record every second and block everyone else’s view. I do get that in the modern culture, there is almost a stigma that you have to share your night with your friends, but these sort of special nights should be ones that you remember for yourself. 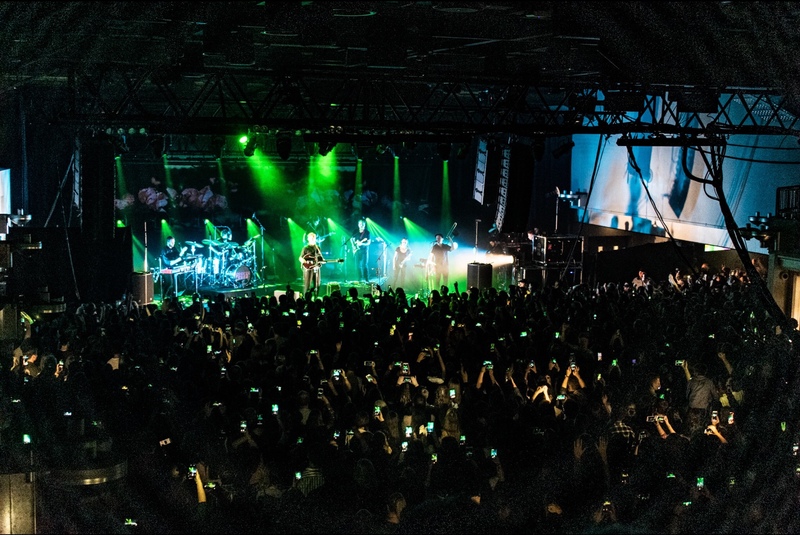 Just live in the moment and have your own memories of the night, and watch the band through your own eyes and not through your phone screen! Anyway, small rant over, back to the music. Whilst some of his more popular songs have taken towards the pop side of his musical spectrum, songs like ‘Did You Hear The Rain’ show that he is capable of writing songs that incorporate the basic elements of a band and provide heavier guitar riffs with big drum beats that are more reminiscent of a typical indie rock sound. The ease at which he is able to switch his sound up between the two and link them both together in one set is phenomenal. It is this genius that enabled his to amalgamate this song into the end of ‘Song 6’, which is a stark contrast, being much slower with a much smoother guitar sound. After the stripped back and passionate performances of ‘Hold My Girl’ and ‘Sugarcoat’, he proceeded with ‘All My Love’. At the end of the song it was perfectly broken down to let all the band members have their time to shine which really showed the talent they all have. This just proved that there is no i in team, nor in George Ezra for that matter, and he probably would not be at the stage of his career that he is without them. With the tall and bold stature that George holds, he has a great stage presence and appears to hold a form of authority and respect from his audiences, allowing him to almost command them throughout his sets. This authority could be seen as his being the conductor to the choir, knowing when to rile them up to help him get in the right mood for a song, and when to settle them down for slower more emotional songs. This was most evident during the middle of ‘Blame It On Me’ where there was somewhat of a carnival breakdown in the music. It just proves that he has the showmanship required at the level he is at and that he really knows how to work the audience and ensure they leave with a smile on their faces. For his ‘last song’, he played his most recognisable song, ‘Budapest’. An upbeat feel-good tune that is full of moments where the crowd can get fully involved. It was a very impressive performance and it would’ve been a very good finish to the night, but to everyone’s surprise (not) he returned to the stage. Playing an electric rendition of ‘Cassy O’, he got the crowd back up in good spirits to end the night on a high. With the whole of the crowd up and dancing, including everyone on the balcony, it was the perfect remedy for a hard, long week, if the rest of the set hadn’t already done so for you. For “one last party” for all the ages in the audience, he continued on the carnival theme to finish his set (for definite this time) with his most recent chart hit, ‘Shotgun’. Putting all of his energy he had left into the song, he made sure the audience would not leave disappointed and gave an outstanding effort. I must say I was really impressed with absolutely everything from this gig. The whole night was all on point and all the individual elements sounded perfect on their own and combined together provided just a prefect performance throughout the whole night. It was also great to see such a mix of ages in the audience, ranging from 5 year olds with their parents, to teenagers out with their mates, to older couples clearly out for a nice meal and then to enjoy the music. If you’re too busy to have read any of the rest of the review and you’ve just skipped to the end, sort your priorities out! But anyway, in short, “it was just a dead enjoyable night”.